Alan and the team wanted Sam and her family to have a beautiful, modern, large garden building that would incorporate the view of the nature reserve at the back of the property. The brief was to build a studio in a specific garden space with lots of light. The views at the back of the studio went directly into the nature reserve, so it was essential that the doors and windows fully maximized this for the family to enjoy. Double doors were added to the front of the studio, with a large ‘picture window’ in the rear wall, to mirror the front. With these doors in place, it was possible to see directly through the studio into the nature reserve, which was essential to the brief. The garden rooms from Sanctum all come with fully insulated walls, floors and roof panels, along with housing standard double glazing, meaning the family will be able to enjoy using their garden room comfortably all year round. The garden rooms have a totally maintenance-free EPDM roof membrane and are clad in beautiful Western Red Cedar. Both of these materials have a lifespan of over 60 years in the UK climate. This studio was topped off with a fantastic sedum ‘living roof’ which is an optional extra. The interior was finished with white walls and an oak laminate floor, along with electric socket points and low energy LED lighting. 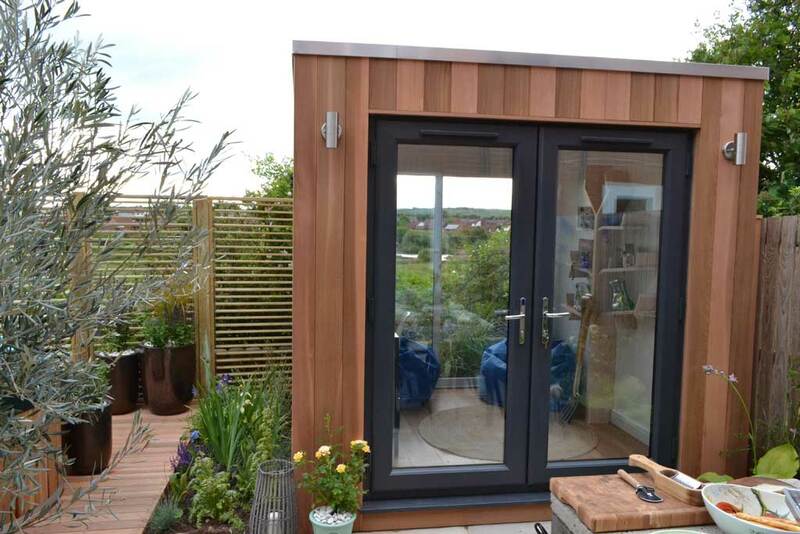 The Contemporary Studio with cubed roof Western Cedar Cladding retails at £8700. Please visit http://www.sanctumgardenstudios.com/our-studios/contemporary/ for more info and how to order. When Sam and Phillip were planning their garden, Sam optimistically told Phillip she would love a hot tub in the garden. 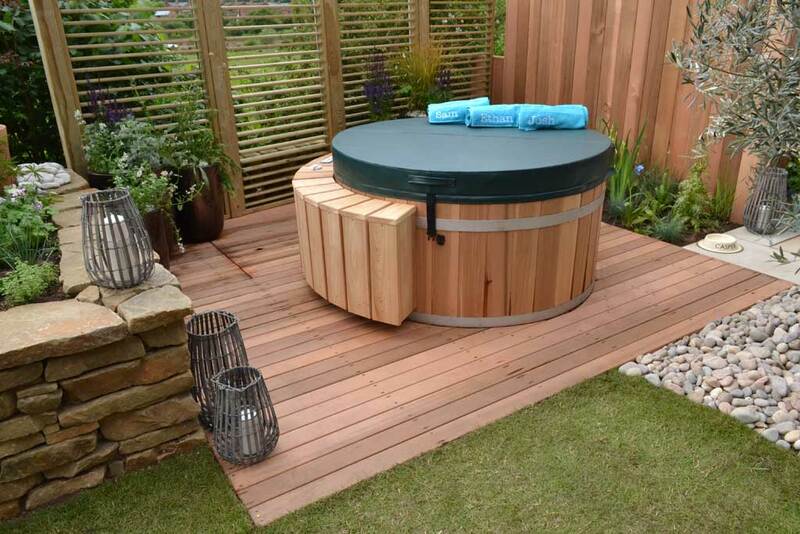 After the passing of Phillip, Alan and the team wanted to make this dream come true and decided to use a cedar hot tub, as it ages gradually and gracefully – requiring no external maintenance. Cedar is commonly used to clad the building exteriors in turbulent North American weather. Northern Lights cedar hot tubs supply hot tubs that can hold up to four, six, eight or ten persons. Convenience is the main appeal of electric hot tubs. Flip a couple of switches and you will soon be relaxing in your stunning cedar hot tub, no matter what time of the year. Your electric hot tub will be fitted with a Balboa heater that offers M7 technology to give you year-round economical heating. Their cedar hot tubs are also available in gas and wood-fired heating. This hot tub retails at £7078 and comes with a 5 year guarantee. Please visit http://cedar-hot-tubs.com for more information and how to order. We wanted a paving material that was natural, but one that looked very modern, so Alan and the team turned to the natural stone experts. CED recommended their new product – Tudor Sandstone Paving. The Tudor sandstone is an Indian fine-grained, quartzitic sandstone -meaning that it is mostly made of small grains of quartz (93%), with small amounts of iron and aluminium oxides plus other trace elements making up the rest. The high quartz content makes this stone very durable, as quartz is one of the hardest minerals found in nature, even harder than steel. The low porosity makes it an excellent paving stone, reducing the rate at which stains can enter the stone. It is the naturally present iron which gives the stone its two-toned colour – as the iron gradually oxidises over an extended period of time, the stone turns from grey to warm orange. The sandblasted finish gives the Tudor sandstone a high non-slip finish, without making it too rough underfoot. 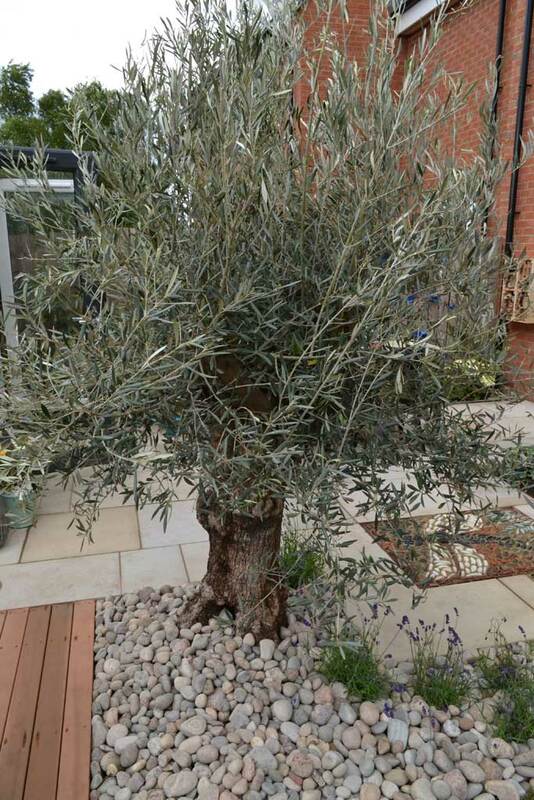 Sam’s husband Phillip was half Italian – we therefore thought an Olive tree would remind Sam of Philip’s heritage. 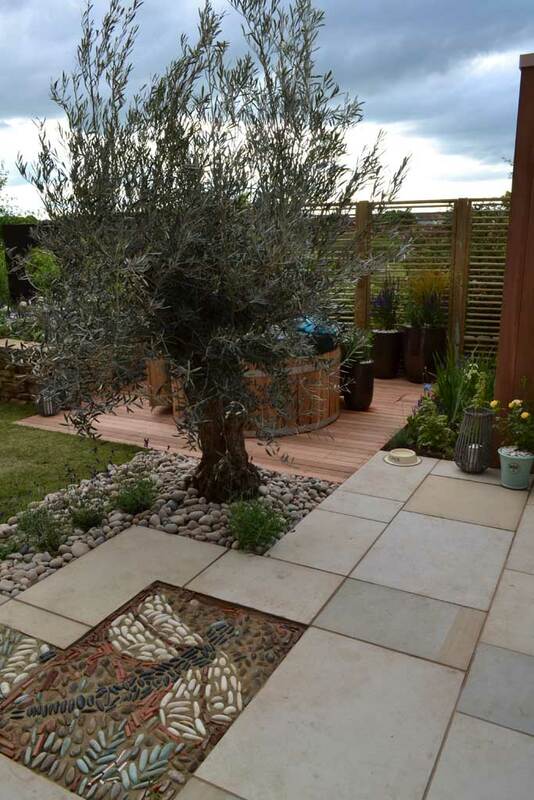 We also felt that the Olive tree would blend well with the cedar hot tub, studio and decking. In addition, the tree added that extra dimension of height. The Olive trees that Villaggio Verde specialise in, range from one year old to hundreds of years old. It is possible for you to own an Olive tree which was originally planted by the Romans. Sam’s garden overlooks a nature reserve, so we wanted to make the most of the view. However when Sam and her family are sat in their hot tub, they may wish to add an element of privacy. Therefore Alan and the team decided on the adjustable louvred fencing, which can be changed from see-through to completely private. We also wanted something that would sit well in this modern garden. 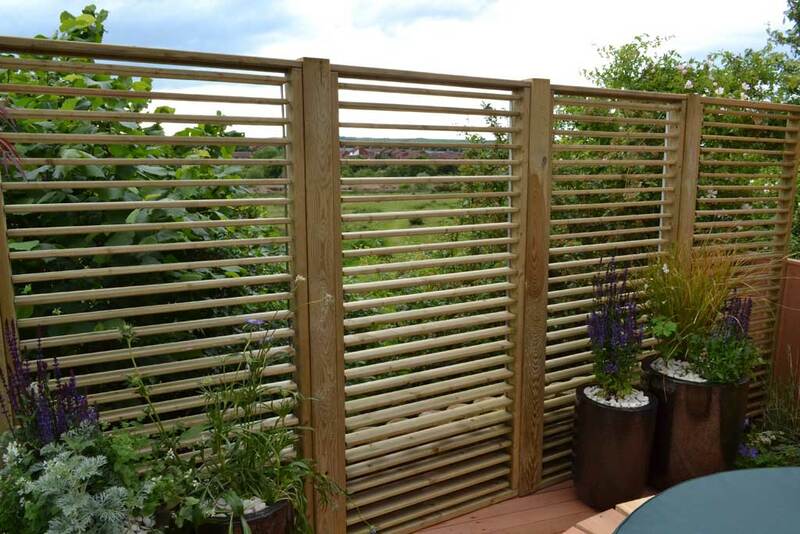 This stylish Venetian-effect, slatted garden screen features slats that open (as the name suggests) and which – when tilted, allow the sunlight through or alternatively tilt in the opposite direction for optimum privacy. This is a fully-framed product, benefitting from pressure treatment, thus enabling longevity in use.